This blog isn’t about making money, or about me trying to convince anyone that I am an amazing human being with a stella life story. No, it will primarily be a simple record of my attempt to train for a marathon and to complete the course in under 3 hours (measured by chip time). The marathon I have selected is the Manchester Marathon on Sunday, 6th April 2014. As I write this first post, that is 18 weeks away (less 12 and a half hours). A blog about running and nothing else will be duller than a self assessment tax form, so I might write about other things as well. We’ll see. So this blog is mainly for me – to record my training, my thoughts, feelings and fears and to hopefully increase my motivation to get the job done. If I get any readers along the way, then that’s a brilliant bonus, but basically this is my diary. My target of a sub 3 hour marathon at Manchester in April 2014 is a perfect SMART objective – just like JFK’s we’ll send a man to the Moon and return him safely by the end of the decade. I wonder if I can do it? I have put money in the name of the blog, because I might write some things about personal finance as well, one of my other hobbies. I like buying shares and making my own investment decisions – don’t give your hard-earned cash to a financial adviser or a fund manager unless you absolutely have to – will be my main advice, but we’ll come onto that later. By the way, there won’t be any share tips – that would be illegal and the Financial police will come around and put a bat up my nightdress. Probably. I want to run the Manchester Marathon on 6th April 2014 in under 3 hours mainly because I have run 12 marathons and never achieved a sub 3 hour time. That irks me. I’m an OK runner, a 47 year old man with PBs of 17:53 for 5K and 37:37 for 10K and according to most online predictors, I should be able to run the marathon in around 2:53. However, I have never got near 3 hours, let alone 2-50 odd. My best ever marathon was run at the Manchester marathon in 1997 when I was 30 years old. It was the old course from Heaton Park to Wythenshawe Park and I don’t have an official record anymore, but I think I ran 3:04 and bits. I remember committing the classic sin of going out too fast – I recall that I went through half way in 1:25 or 1:26. At 15 miles I was struggling and the wheels came off and I adopted a run-walk strategy, hobbling home to Wythenshawe Park. I ran the London Marathon in 1999 in 3:10 and then I gave up serious running for a few years when I moved from Manchester to Leeds with my job. I kept running a little to maintain general fitness and to help with my main sport at the time, which was cricket. I ran a few marathons here and there, mainly as City-break holidays with mates from Manchester, but I never did enough training and every one ended up as a very tough day out. The worst experience was at New York in 2007. A mate had a place but couldn’t run because of an injury, so at two weeks notice I accepted his offer of his number and booked myself a flight and a cheap dive hotel on 31st street. I’d done no marathon specific training. New York blew my mind – the greatest, most alive city I have ever experienced, but again I made a series of stupid errors. Like walking around Manhattan for about 6 hours a day in the two days prior to the race and exhausting myself. Like wearing brand new Saucony running shoes bought cheap from the Expo for the race itself (yes, I know) and being crippled with blisters after 10 miles. Like carrying on when I was clearly injured just through sheer bloody-mindedness and ending up in the Medical tent (thankfully nothing serious). That marathon took me just over 4 hours. It felt like a week. In 2008 I started running regularly again. I saw an advert in my village parish magazine for a free weekly timed 5K run in Hyde Park Leeds. In those days it was called Hyde Park Time Trial, but was later rebranded to parkrun. I have run over 175 parkruns in the last 5 years, mainly at Leeds and I have improved my 5K time from just under 22 minutes to just under 18 minutes. My third ever parkrun was in February 2008. There was a good covering of snow on the ground. I thought the event might be off, but I went down to Hyde Park on the off chance and saw that about 50 hardy souls had turned up and the event was on. Having finished about 25th in my first two parkruns, I was flabbergasted to win that day – my first ever race win of any description – in a time of, wait for it 20 minutes and 50 seconds. That still stands today as the record for the slowest ever winning time at Leeds parkrun. I will confidently write here and now that my record will stand in perpetuity. So parkruns got me back into running and I began to obsess over improving my parkrun PB. I quickly got it below 20 minutes and then have chipped away and gradually lowered it to 17:53 (17:58 at Leeds). I feel I have made good progress, especially over the last two years. Even though I am at an age where I should be getting slower, the counteracting force of consistent training is still winning out and my times are improving, though the increments are small now. There are many cliches about age not being a barrier, however in my case it appears to be at least partially true and I am enjoying finding out just how quickly I can make this ageing body run. I have run two marathons in the past 14 months – at Kielder in October 2012 and Manchester in April 2013. Kielder is an off road trail marathon. Its also quite undulating, so not a place to chase fast times. I ran 3:35, but had a great day out in the quite wonderful Northumbrian hills. At Manchester in April this year, I had expected to run as a pacer for my mate Tim who wanted to run sub 4:15. Because I thought that time would be quite easy for me, I didn’t follow much of a marathon training plan. I just did my normal 3 or 4 steady 45 minute runs during the week, parkrun on Saturdays and maybe a few longer runs on Sundays, I did about 3 x 16 mile runs along the Leeds Liverpool canal and one 20 mile run three weeks out from the marathon. With 2 weeks to go, Tim informed me that he wasn’t going to run. He hadn’t really trained and he has a very high-powered and stressful job. So I had a dilemma. There was no point in jogging around in 4:15. I knew I couldn’t get near 3 hours because I hadn’t done a marathon training cycle. However, I had paid for my number and it seemed a shame to waste it. Therefore I decided to wait and see what the conditions were. If it was freezing or pouring with rain or (however unlikely in Manchester in April), hot – then I would swerve the race. If conditions were good then I would toe the line, but run very conservatively at the start – go out much easier than I wanted to and just experiment with the strategy. After all, I had no time targets or expectations. The day was perfect for marathon running, about 7 degrees at the start rising to around 11 degrees. Calm with no wind. So I was running. As the gun went, all the 3 hour runners shot off and I jogged out at 7.30 pace for the first mile, letting hundreds overtake me. I calmly settled into a rhythm of around 7:10 per mile and just kept going at what felt like a very comfortable and conversational pace. I went through halfway in 1:34:30, feeling good. 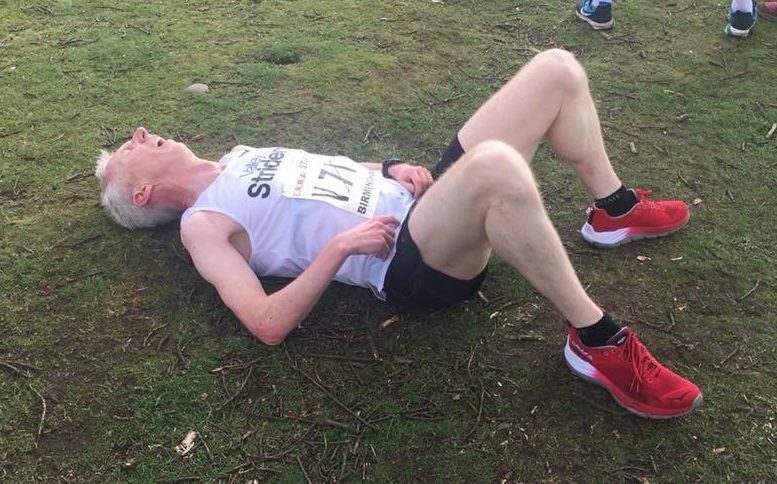 In all my previous marathons, I had started suffering badly between 14 and 18 miles and the last part of the race, without exception, had always been a hellish experience. I had always had to walk for a bit in every marathon – even the 3:04 in Manchester 1997 and 3:10 in London. However, instead of slowing down, I started going faster. By 15 miles, I was passing runners in droves, virtually nobody came past me. It felt great, I was strong and I put in a few sub 7 minute miles, even around the 20 mile mark. The last three miles were hard, but I was only slowing marginally – still maintaining an average mile split of under 7:20, not the oh-no-the-wheels-are-off 9 minute miling of previous attempts. I was amazed and delighted to finish in 3:07:15 – a Good For Age qualifying time for both London and Boston. It was also a negative split. It was a revelation to me – this was how you were supposed to run the marathon! All those books and articles about starting slowly and trying to run very easily until 20 miles – and ideally running a negative split – were 100% correct. Why had I not done this before? Surely with a committed 14 week training cycle, I can throw that 3 hour monkey way off my back. So, here we go on this quest (If I ever refer to this as “a journey”, then £50 will immediately go to the favourite charity of the first reader to point it out). M – 18 Weeks/ 49.88 miles. Longest run 12.4 miles. Parkrun (Leeds) 18:23.